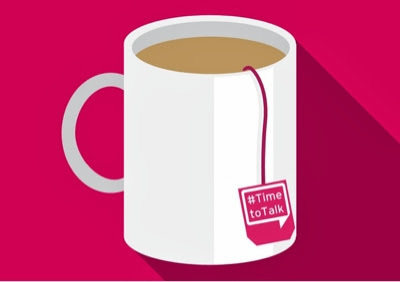 Today, Time to Change, England's biggest mental health anti-stigma programme aims to get more people talking about mental health than ever before with 'Time to Talk Day'. People all over the country will be running events, sharing experiences online and even just having a cuppa and a chat with a friend to help get that conversation started. One in four of us will be affected by mental illness in any year. That's why starting a conversation about mental health is important. It helps people to know they're not alone and can start to take the taboo out of something that affects us all. It's #TimetoTalk! Be part of the big conversation on Thursday 6 February. But even more importantly carry on those conversations, they shouldn't be something we do just one day a year.